Anatoli’s vision and passion have been the driving force behind the company’s technical and statistical strategy. As a former researcher and analyst on the sell side in Sofia, Bulgaria he brings his wealth of experience, market views and insights to our companies strategy and graduate training program. His work has been published and cited throughout financial media outlets in Bulgaria. 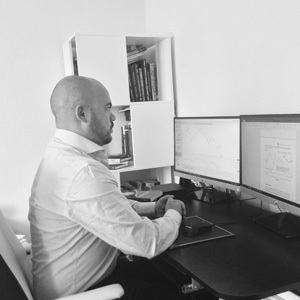 His approach to trading involves merging fundamental, technical, statistical and behavioral finance to exploit pricing inefficiencies across global markets. Since 2007 he has worked as a private trader whilst garnering experience in Internet Based Ventures, Financial Technology (FinTech) and Business Development. In addition to his First class honours degree in Business Enterprise Creation & Management, Anatoli is a Chartered member of the Society of Technical Analysts in London (MSTA), a Chartered Financial Technician (CFTe) from the International Federation for Technical Analysts and is currently working towards gaining his Project Fundamentals Qualification (PFQ) from the Association for Project Management (APM).